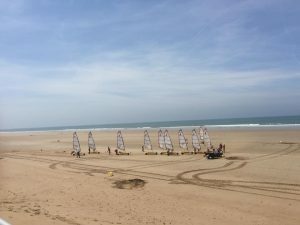 There is no denying my love for Les Sables d’ Olonne. 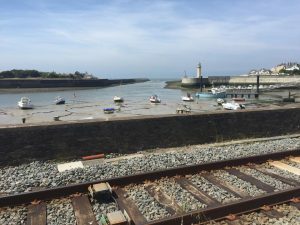 Its elegant architecture, Grand Plage, and hum of a true French seaside town help make it a firm favourite, however, I was curious about the town of Saint-Gilles-croix-de-Vie, situated 10 miles north of Chateau La Foret. I had driven across the bridge over the river Vie several times and was intrigued by the pretty church towers, moored boats, and you guessed it….a carousel. I followed the signs for Centre Ville and easily found a large car-park next to the bridge overlooking the harbour, I’m not sure how easy parking would be in high season however. Once parked, I headed over the road and wandered through the market outside the church, there didn’t seem to be that much to see other than the market or church, so I headed back across the road and over the bridge. Saint-Gilles-coix-de-Vie has the vibe of a holiday town, one that really comes alive during the summer months. There are traditional souvenir shops selling holiday staples such as woven bracelets, keyrings, and tea towels, alongside boutiques and art galleries. Unlike Les Sables d’ Olonne, where its shops can be found around the church and down avenues, Saint-Gilles has one main thoroughfare that opens up into a market square surrounded with eateries and a small playpark in the centre. I decided I keep following the road, and fond the train station and tourist information. The tourist shops and cafes petered out, but undeterred I carried on up to the lighthouse; the main beach of Saint- Gilles is back on the other side of the River Vie. I did notice a Petit Train, always a holiday must do in my opinion, as they offer a great way to see a place and find out where to head if you’re short on time. I decided to drive to the beach, because from where I was parked, I didn’t know how far away the beach was; it would have been a fair walk if I was carrying all the paraphernalia involved in a trip to the beach, and wow, was it worth it! The beach of Saint- Gilles is a long, wide, flat plane, where the sky meets the sea; it’s pretty impressive. 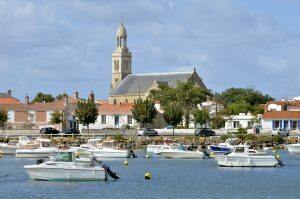 Overall, Saint-Gilles is definitely worth a morning or afternoon trip out, although it doesn’t have the impact of Les Sables d’ Olonne, it does feel like you’re on holiday, which is a pretty good feeling!